Cool, thanks for sharing the results, and for making the test code available as a separate package. 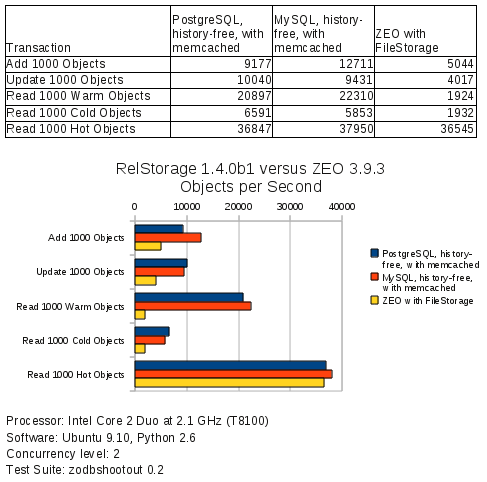 I’m also interested in getting more information about the relstorage + mysql + master/slave replication. Has this configuration been documented anywhere? I have read that there is a problem to implement this because the “Two phase commit” feature is not exposed by MS-SQL server . Is there solution to overcome this problem, Without introducing too many layers? Can we use PyMSSQL and ADODB Python extension to implement the relstorage Adapter for MS-SQL. Has any one tried this before? Are there any other major concerns you would have for developing MS-SQL adapter component? Will you help us in developing the MS-SQL adapter for Relstorage? Please point us in right direction on the subject.